KVS/ Kendriya Vidyalayas 6205 Principals, PGTs, TGTs, PRTs Recruitment 2016- Online Applications @kvsangathan.nic.in . KVS Recruitment 2016-2017, kvsangathan.nic.in, Kendriya Vidyalaya 6205 TGT, PGT, PRT, Principal Vacancies KVS 6205 Principal, PGT, TGT, PRT Posts 2016 Recruitment in Kendriya Vidyalayas. KVS teaching,Non teaching Posts 2016 in Kendriya Vidyalayas. 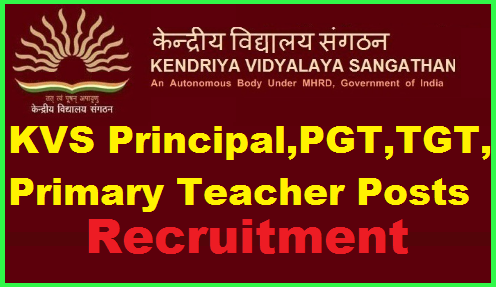 Recruitment of Principal and other Teaching Posts in Kendriya Vidyalaya Sangathan. Kendriya Vidyalaya Sangathan (KVS), henceforth mentioned as KVS, an autonomous organization under the Ministry of Human Resource Development, Government of India invites Online applications from Indian Citizens for filling up the vacancies of Principal and other Teaching Posts to be filled up by direct recruitment. Government of India have issued the teaching posts 2016 recruitment notification and each state, KVS invites applications from the Indian Citizens for recruitment on teaching posts(Primary Teachers (PRT), Trained Graduate Teachers, Post Graduate Teachers for the year 2016-17. Principal: Master’s Degree with 45 % aggregate marks with B.Ed or its equivalent. Post-Graduate Teacher: M.Sc from Regional College of Education of NCERT or Master’s Degree or its equivalent with minimum 50% marks. Trained Graduate Teacher (TGTs): Bachelor Degree from Regional College of education of NCERT with at least 50 % marks. Knowledge of computer is must. There is age relaxation is given to the deserving candidates as per rules and norms 5 years for SC/ST, 3 years for OBC and 10 years for women (SC/ST) except for the posts of Principal. 8. Take a print of submitted application. Candidates will be selected on the basis of their performance in written examination and interview put together. Admit Cards: candidates will get the Hall Ticket from official website on its official before the exam. 4. Date of Written Test: November/ December, 2016.